"The Light on a Trilogy"
Although Buzzy has passed his books are still being sold while supplies of the current inventory are available. Mahalo for everyone's support and aloha for grampa/uncle Buzzy. 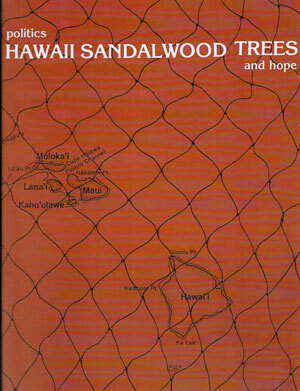 "Politics, Hawaiian Sandalwood Trees and Hope" is currently sold out. Originally published in 1982, "Politics, Hawaii Sandalwood Trees and Hope was republished in 2012 with a large update and critically important content demystifying the United States government's involvement in the overthrow of the Hawaiian Kingdom in 1893. ORDER THIS ITEM TO MEET UP IN DOWNTOWN HONOLULU (BISHOP /ALAKEA) TO RECEIVE YOUR BOOK(S) - IF YOU ARE UNABLE TO MEET UP OR FOR SHIPPING PLEASE CHOOSE THE OTHER OPTION. ORDER THIS ITEM TO HAVE YOUR BOOK(S) SHIPPED TO YOUR DOMESTIC ADDRESS (HAWAIIAN ISLANDS AND CONTINENTAL U.S.). IF YOU ARE AROUND THE DOWNTOWN AREA OF HONOLULU AND WOULD PREFER TO MEET UP, PLEASE CHOOSE THE OTHER OPTION.